ManTech International is among the finalists for the Northern Virginia Chamber of Commerce and Professional Services Council’s annual Greater Washington Government Contractor Awards in the Contractor of the Year category for companies greater than $300 million. The winners will be announced at an awards program Nov. 5. 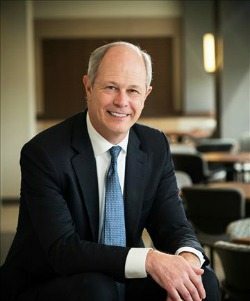 WashingtonExec spoke with President and CEO Kevin Phillips about ManTech’s recent contract wins, ways the company is educating both its own workforce and those who could one day enter it, and the organization’s plans for the future. WashingtonExec: What is your organization’s growth plan over the next three to five years? Phillips: ManTech will continue the strategy that has driven our success for the past 50 years: 100 percent focus on supporting the customer mission with innovative, advanced technologies that bring “digital to the tactical edge.” As always, we will make it our top priority to be the “employer of choice” in our industry, to ensure that we have the best people with the right talents and expertise to serve our customers. In the past year, we have been very successful in attracting top-flight people, building the employee base to some 8,000 skilled professionals. Their expertise in the solutions our customers need and demand — cyber, data collection and analytics, enterprise IT, systems engineering and software development, and military sustainment — will continue to help drive our success in the years ahead. ManTech will also be attuned to practical applications of exciting advances in machine learning, deep learning and AI that support specific missions. Finally, ManTech will remain open to synergistic M&A opportunities that complement our business and enhance our mission support capabilities. Phillips: We see the opposite happening. This is no longer a “business as usual” environment, where agencies are told to “do more with less,” with the end result of spending billions of dollars on simply maintaining the IT they have in place. We see a rapidly expanding government marketplace unlike any other in recent years. Government agencies know their needs — in cyber, cloud, data collection and analytics, enterprise IT, systems engineering and software development, and machine learning — and are anticipating the future impact of deep learning and neural networks. They are in the hunt for partners like ManTech who can deliver technology solutions that address current and future mission requirements. ManTech is growing because our technology, capabilities and solutions focus is well-aligned with customer needs. Phillips: The largest accomplishment by far is our work for defense, federal civilian and intelligence community agencies demonstrating that ManTech is “Securing the Future” of this great nation, our democratic institutions and way of life. Signature wins have included our $816 million award by the Department of State, an $847 million contract with the Army and a nearly $1 billion contract with a major defense agency. But I am most proud of the work we are doing for our customers in these and many other examples: protecting our soldiers from roadside bombs, safeguarding American diplomats worldwide, and providing secured enterprise IT that supports mission-critical work in national security. Phillips: Our approach to customers has never changed and never will. We make mission our No. 1 priority, and dedicate ourselves every day to improving results and performance. We see our work as a continuous evolution. To that end, we are ramping up efforts to bring “digital to the mission” at the tactical edge. That includes the full range of apps that sit on military platforms, plus our CDM for federal agencies, managed services for customers like the Jet Propulsion Laboratory, and the sophisticated cyber defenses we build, maintain and enhance for the IC, among many other examples. We apply the same strategic approach to our most valued asset: our people. In the last year, we have partnered with Purdue Global University to launch college-accredited courses that apply toward bachelor’s and master’s degrees in cyber and cloud — invaluable training for employees that serve our customers and enhance employee careers. Plus, we have ramped up internal communications programs that keep employees abreast of these and other opportunities, and enhanced our IT programs to simplify and speed daily work tasks. These and many other programs make ManTech the No. 1 place to work. WashingtonExec: How does your organization encourage employee engagement? Phillips: Through our Technical Elite program, we reward employees who come forward with innovative technical solutions that enhance or provide new ways to support the customer mission. This year, we showcased some of the finest examples at our annual TechShare conference, an internal event where ManTech experts come together to hear from some of the nation’s foremost technology leaders, get an inside look at exciting technologies in the works at ManTech, and to exchange ideas on what may come next. Four of our employees took the stage to share proposed innovations before a standing-room-only audience of 500 employees — and another 500 watched the event live-streamed. All who attended agreed this was an outstanding event. One measure of success: Nobody wanted to leave! Many others vowed to come forward and share their own ideas for great tech innovation at the next TechShare. WashingtonExec: Is your business involved in cultivating our local pipeline of young STEM professionals? Phillips: At headquarters, we have an entire floor dedicated to our ManTech University. Throughout the year, we work with local schools to welcome young students with a STEM focus, and hold a range of classes on cyber and other topics to stimulate their interest in pursuing rewarding careers in technology. New hires interested in cyber and cloud can apply to take courses through our partnership with Purdue Global Course. Applicable career and military experience can apply toward coursework and degrees.